If you want to upgrade your favorite keyblade to its most powerful form, you’ll need to farm some key materials. Here’s where (and how). It wouldn’t really be a proper large-scale Japanese RPG without some good old weapon management, and Kingdom Hearts 3 has plenty of that. Protagonist Sora can now equip not just one of his iconic keyblade weapons, but three – and that means three times the options in any given battle but also three times the management in the back-end. Every keyblade is different, and as we suggest in our KH3 tips and tricks you’ll want to pick keyblades that match up to your style of play in their stats and abilities. Once that’s done, you’ll want to set about upgrading them as you head on your journey towards the end of Sora’s journey (and hopefully also the secret ending movie that teases an all-new journey) – and that requires certain materials. Keyblade upgrades happen in the Workshop section of the Moogle Shops you find scattered throughout the worlds of KH3, and they’re vital to keeping your choices of keyblade up to scratch. While there is one clear winner in the power stakes – Ultima Weapon is the best keyblade in KH3 hands-down – every other keyblade can be more or less made on par with each other through upgrades, thus making your choice of which to use more about abilities and the various form changes each weapon has. Fluorite can be found out in space when flying your Gummi Ship. As a material that’s available right from the start of the game, that means Fluorite will spawn in all three areas of space you can explore: Starlight Way, Misty Stream and The Eclipse. Try shooting asteroids to blow them to pieces and occasionally it’ll drop Fluorite. Asteroids and the like repopulate every time you head back into space from a world, so in theory you can farm a lot of this material this way. Treasure Spheres out in this area of space can also contain Fluorite. Fluorite can also be straight-up purchased from the Moogle Shop. It’ll set you back 500 Munny a piece, which means it isn’t the cheapest or most economical way to do this, but if you hate flying the Gummi Ship this is totally a viable option. Finally, Fluorite can be found out in the worlds of KH3 in chests. As far as we’ve seen so far this material won’t drop from heartless enemies, but it does show up in chests – and in the early game, several pieces are hidden away in Olympus, albeit in the world after you first visit it. Head back to Olympus and re-explore once you leave Twilight Town and have free reign – you’ll walk away with several pieces. Damascus can once again be found out in space, though it won’t appear in the first region you have access to. After completing your first four worlds of KH3 you’ll leave Starlight Way and head to Misty Stream. 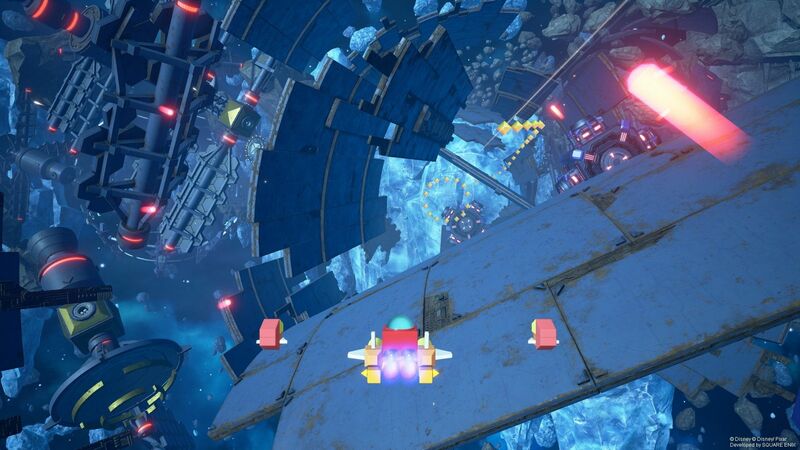 Asteroids and Treasure Spheres out here can be home to Damascus, so explore this region of space in detail in your gummi ship for a chance for some of those sweet weapon-improving drops. Later in the game, Damascus will show up in the Moogle Shop – seemingly after you complete Arendelle. Buying it outright in this way is an expensive business, but it can save you time and effort if you have the Munny to spare. Damascus can also appear in chests out in Worlds too. It’ll first begin to show up in the Kingdom of Corona, but later worlds like Monstropolis, Arendelle and the Caribbean will also contain chests that drop this vital material.